The nice folks on the Tri-Lamb Council recently sent us our next shipment of lamb. 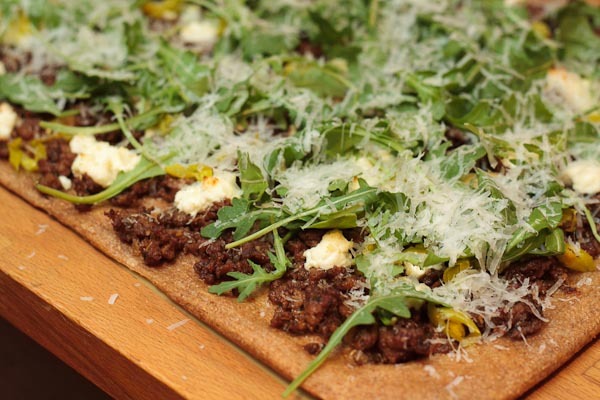 The seasonal recipe this time around was a lamb flatbread with arugula and goat cheese. It is ground lamb, which is a fun switch from the large roast we had last time. They sent the lamb, along with everything needed to make the flatbread. We again teamed up with our downstairs neighbors and decided to go with a Mediterranean theme. I am always a fan of making your pizza dough, since it is super easy if you have a food processor. However, they included some frozen pizza dough, so I gave that a shot and it turned out good. If you are holding off making your own pizza because you don’t want to deal with the dough, give frozen dough a try, it seems to work pretty good. I cooked the lamb ahead of time, which made it really easy to put the flatbreads together later. With the prep work done ahead of time and the oven preheated, we were able to prep and bake the pizza’s in 25 minutes or so and most of that time was just baking them. Everything was easy to put together and required minimal attention, I would definitely recommend this dish if you are having people over. 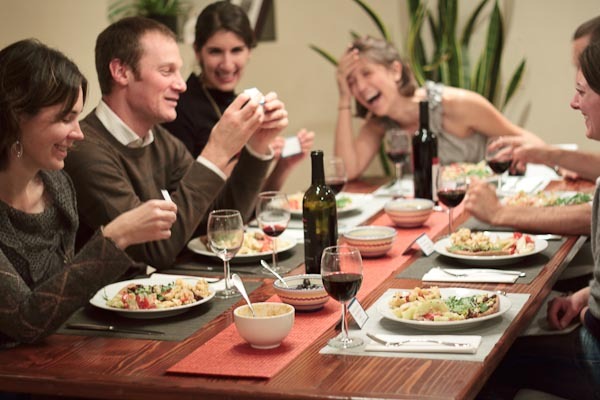 You get to have fun hanging out and you still impress your guest with a delicious dish. Lamb may not seem like a normal pizza topping, but really it is a natural fit. On pizza you want a strong meat, like pepperoni or sausage, and seasoned ground lamb delivers perfectly. While this recipe has more of fancy, Mediterranean flare, you could easily take it in a different direction with some Italian seasonings and a tomato base. The Mediterranean theme really came out in the dessert and our drink selection. 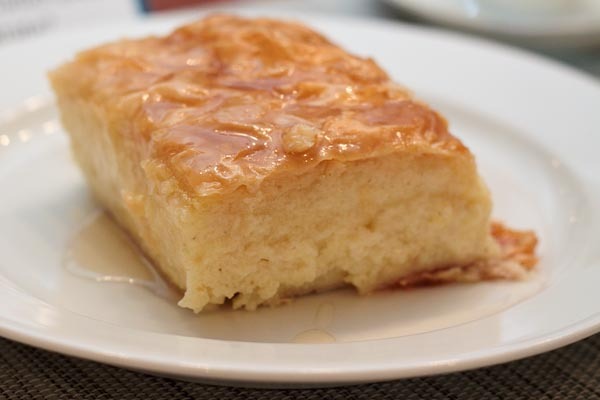 One of our guests broughtÂ Galatoboureko, which is a Greek phyllo custard and is extremely delicious. Between the eggs, butter and phyllo, it may not seem that healthy, but the recipe makes a lot of servings and it is really good, so who cares. We also had a nice assortment of Greek liquors, all of them were pretty strong. 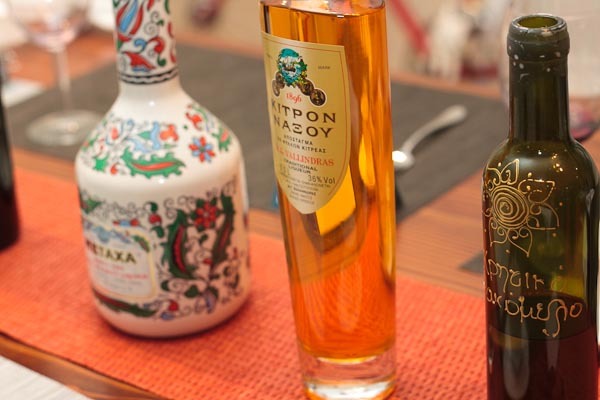 Metaxa is a Greek brandy, which if you are a fan of brandies, is supposedly pretty good. No one was too keen on it though, it might be better mixed with something as opposed to straight up. Kitpon Naeoy is a lemon liquor that is produced on the island of Naxos and is made with the fruit and leaves of the citron tree. Since citron taste sort of like a lemon, it tasted a bit like lemoncello, but was a bit more mild. It used to be popular, but went out of style and most of the citron trees were cut down. It is pretty rare now and almost impossible to get anywhere besides on Naxos. This was a much bigger hit and everyone was a fan. The final liquor Carolyn and I brought back from Crete, where we got it from a random honey vendor on the side of the road. It is a honey liquor that was about the same strength as citron one and quite tasty too. Unfortunately, we have no idea what it is called and can’t read Greek. One of the best parts of the evening were the pun filled place cards that came with the Lamb kit. Here are a few of our favorites, along with some educational lamb tidbits. On average, a 3-ounce portion of lamb contains 25 percent of the daily value of niacin, necessary for processing nutrients and proper enzyme function. Heat oven to 450 degrees. Brush rimmed baking sheet with 1 teaspoon olive oil; using your hands spread dough over entire length of the baking sheet, pushing dough to edge (or roll out on floured surface and transfer to pan). Bake pizza dough for 5 minutes. Remove from oven and set aside. Heat 1tablespoon oil in large non-stick skillet over medium-high heat . Add lamb, shallot, garlic, tomato paste, oregano, 1/8 teaspoon salt and 1/4 teaspoon pepper, cook until lamb is completely browned about 5 minutes. Remove from heat. Brush par-baked crust with 1 teaspoon olive oil. Evenly distribute cooked lamb and pepperoncini, top with crumbled goat cheese. Bake for about 15 minutes, until cheese looks slightly melted and edges of crust are golden brown. Toss arugula with remaining 1 teaspoon olive oil, set aside. Remove from oven and top with dressed arugula. Bring syrup ingredients to a boil and simmer for 10 minutes. Cool completely and refrigerate. Preheat oven to 375 degrees. Cook milk and sugar and vanilla in a large saucepan over low heat until sugar is dissolved. Slowly stir in farina. Continue stirring until mixture comes to a boil and thickens slightly. Beat eggs in a bowl until very thick. Pour a few ladlefuls of hot milk mixture into beaten eggs to temper. Pour egg mixture into milk mixture and continue stirring over low hear until mixture is thick and foamy. Remove from heat. Butter a 11.5â€x17â€x2.5â€ pan. Layer 4 sheets of phyllo, overlapping the sides of the pan and buttering between each sheet. Layer 6 more sheets on the bottom of the pan, buttering between sheets. Pour custard into pan and turn overhanging phyllo on filling. Brush with butter. Cover custard with the remaining (10 or more) phyllo sheets, buttering between each sheet. Before baking, cut through the top layers with a sharp knife into 2â€ squares. Bake 45-60 minutes or until phyllo is golden brown. Test for doneness by inserting knife into the center of the galatoboureko. Knife should come out clean. Spoon cold syrup over galatoboureko. Use Â¾ syrup at first and add remaining syrup as needed. Cut when completely cool and refrigerate. Bellissima e buonissima ricetta, complimenti? Very good! 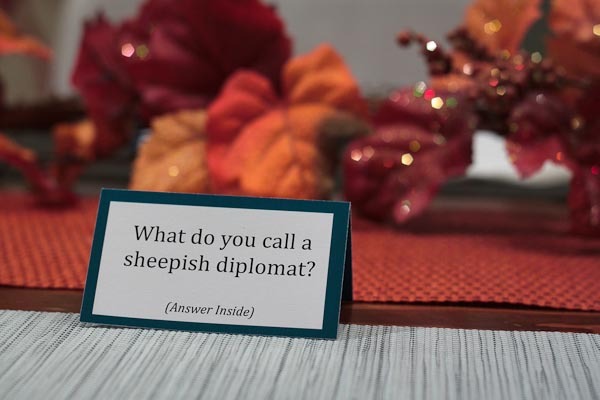 Don’t leave me hanging…what do you call a sheepish diplomat? 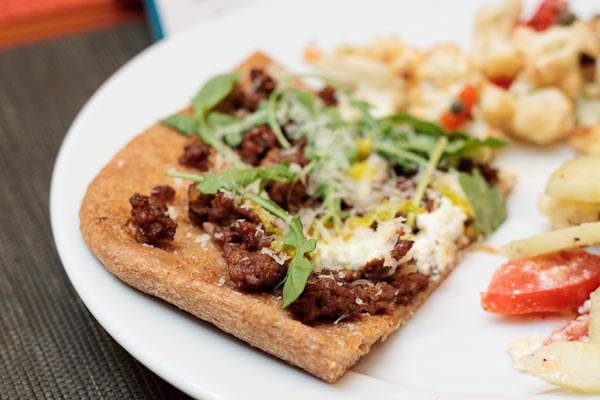 That lamb flatbread looks amazing. 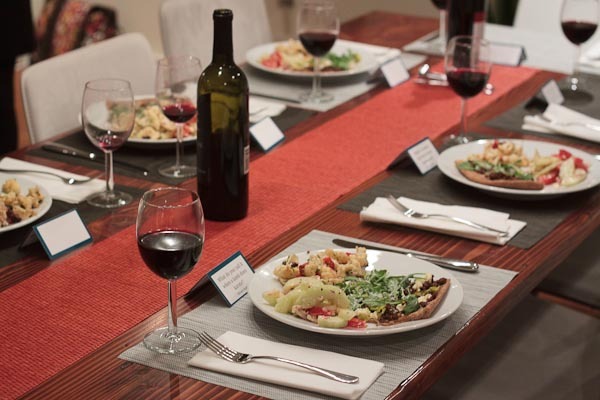 What a fun dinner party to be invited to!